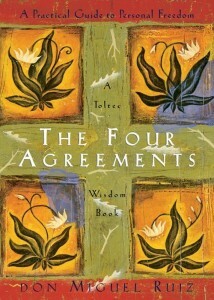 Perhaps you have encountered The Four Agreements—a book and guide for achieving personal freedom. One of the agreements is “do not take anything personally” by which Don Miguel Ruiz means that nothing others do is because of you. What others say and do is a projection of their own reality. I’ve always seen this as a fabulous way to approach life, and not get caught up in the pain and suffering that comes with deeply internalizing the beliefs and behaviors of others. However it isn’t always the easiest thing to practice! It is hard for me when others think badly of me, or as is more often the case, I project that other people think badly of me based on my interpretations of their words or actions. For instance, as a trainer and facilitator, I have fallen into the trap of misreading a participant’s face. This week someone in my training kept closing his eyes and a woman was frowning from the back row. I witnessed my own tendency to take things personally. I thought “he must be tired because he’s bored” and “she must be angry because she doesn’t like how I train”. My attention began to go towards insecurity and defensiveness, instead of towards the rest of the people in the room who appeared happy and engaged to me. But then I stopped myself and remembered that it was 1pm, prime nap time. And the office had been served post-superbowl huge rich cupcakes during lunch. I consciously chose to brush off the worried voices in my head and keep offering my presentation to the best of my ability. I later received an email from the “angry person in the back row” thanking me so much for helping her understand things better. How much time and energy do we waste reacting to other people’s realities, or our perceptions of their realities? Even if that person frowning in the back row had been pissed off at me, why should I let that derail my joy and service to the world? I am open to feedback, and seek to grow and improve by listening to people around me. But when I hear that feedback, I have to check in with my integrity and my highest understanding, to decide if that is true for me or not. When someone brings an issue or conflict to me, it is inherently colored by their own background, personality, and emotions. Rightly so. I can receive all of that, and practice active listening. And decide to change how I have been doing things, or not. Offer an apology if that’s the right thing to do. But not take any of it personally. I love and care for myself, and believe that at my core I am a worthy, loveable, and whole person. I have compassion for the parts of me that are evolving, the parts that feel hurt, and what I perceive as my weaknesses. I practice radical forgiveness of myself and others—consistently, and especially during times when we act out in destructive ways out of fear and pain. If you find yourself having a hard time accepting any or all of these, that is a great sign that you have some emotional breakthrough wanting to happen in that area. Shadow Work can provide a wonderful container for that work. Some people find self-care flows more naturally than others. Some people don’t easily take care of their needs, but they have a lot of compassion for the weak or pained parts of other people. Some people may blow up really loudly, but forgive quickly. Others hold on to resentment for a long time. 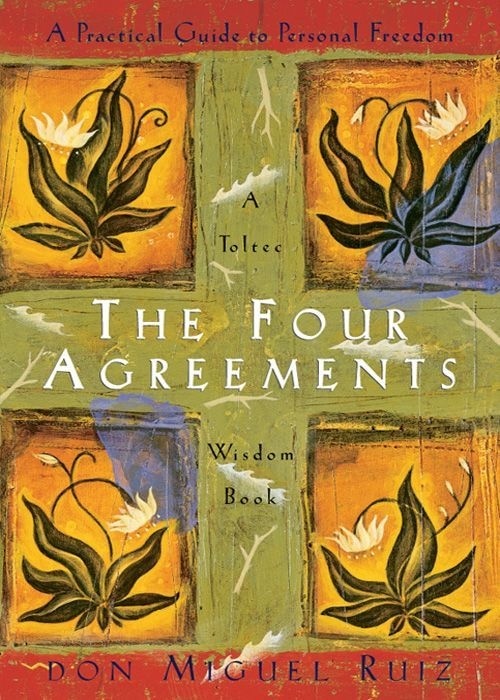 We all have different challenges to keeping an agreement to not take anything personally. Understanding these personality differences has been a huge help to me in loving and forgiving myself and the people in my world. I will examine how the Enneagram Personality System helps us in not taking anything personally in my next post! The timing of this post was very fortuitous for me. Thank-you for the thoughtful reminder to examine to root of my defensive reactions, rather the momentary triggers. I’m glad to hear it! Thank you for reading. I found your blogs when I searched for Enneagram 8 to try to figure out why I am so frustrated. I found your post: Eight Confessions of an Enneagram Type 8 Woman, and it really resonated with me. I like this post, as I have also learned that many things have little to do with me, it is the other person and their reality. Being a strong, confident and very capable personality, I hold myself to higher and higher standards causing stress. And I really understand what you mean by my perception/interpretation that others think badly of me. You seem to really understand me and what I am going through. You have found your voice on this website, I am still trying to find mine, as people often tell me I should “post that so others could benefit”. But having been the recipient of a lot of people taking advantage of my gifts and generous nature, I sometimes cringe at that idea. I have posted a few articles on linkedin, but have not had much success. Maybe that is the problem – thinking it has to do with success, so much as just stating the opinion. Thank you so much for your insightful posts. I look forward to more posts and reading past posts. Hi Susan, thank you so much for reading and responding! I think it’s so true that 8’s can be very generous and are sometimes taken advantage of in their innocence. I don’t think many people recognize that truth about us–and it is hard-won for those of us who experience it ourselves. I wish you the best, and encourage you to write from the heart in a way that feels safe and right for you.